Palm reading is most popular in all over the world.Its is also Known as Palmistry or Chiromancy. 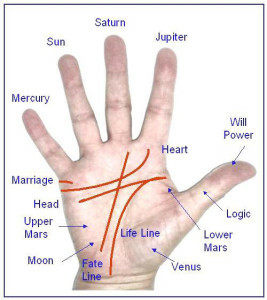 Palmistry is practiced all over the world. It has its roots in Indian astrology.Its is knowledge of evaluating a person’s character and future life by studying the palm of his/her hand. Here a guideline how to gain insight just by holding someone’s hand. In females, The right hand is what you’re born with, and left is what you have accumulated throughout your life. There are different schools of thought on the matter. Some psychologist say the left hand shows potential and what could be — not necessarily what will be. 2) Identify the four major lines.